Part of the fun of traveling to other countries during the holiday season is getting a glimpse of how other people and cultures celebrate in ways that are completely foreign to you. Many people travel to visit loved ones during the Christmas season, and Adam and I are no different- but for the last two years, as soon as the last gift is unwrapped, we have found ourselves zipping up suitcases and heading off to the airport to capitalize on the few extra days of vacation we can get at the end of the year. We decided to ring in 2016 in Reykjavik, Iceland. The trip was incredible- and we covered it in detail right here on the blog- but even better than the delicious Icelandic hot dogs and visit to the Golden Circle was immersing ourselves in Icelandic holiday traditions. We landed in Iceland the day before New Year’s Eve, which meant we just missed Christmas in Reykjavik- or so we thought. 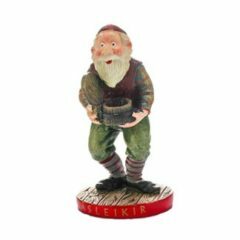 Little did we know, Christmas traditions kick off weeks before December 25th and continue past the first of the year, which meant we had a chance to learn about the colorful characters who take the country by storm: the Yule Lads. 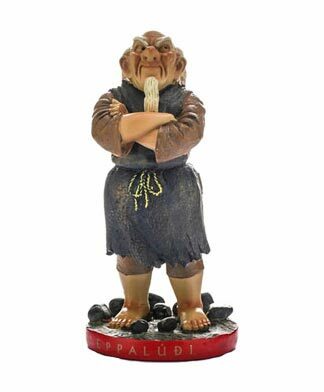 Icelandic folklore shares that the Yule Lads are the 13 sons of the formidable troll Grýla and her husband Leppalúði. 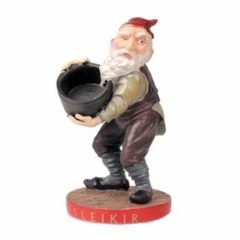 Leppalúði is a shiftless, lazy waste of space who contributes very little to the season. 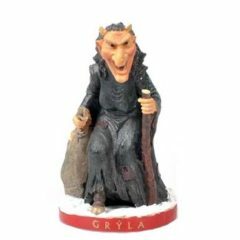 The woman behind the man is Grýla, who is described as a pretty wretched creature with a bad temper and a taste for soup made from naughty children. Fortunately for the good children of Iceland, she can’t touch kids who are well behaved; the bad kids are fair game, though. 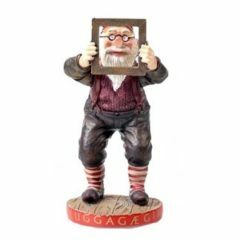 The Yule Lads, while not nearly as dull as their father or horrible as their mother, officially kick off the season by coming down from the mountains, one by one, beginning on December 12. 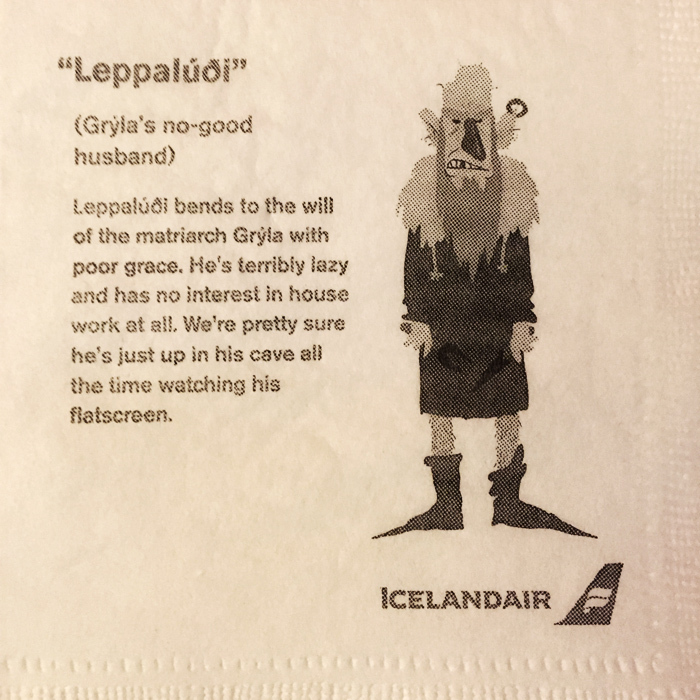 They aren’t particularly well mannered, and they each have a characteristic that might surprise or irritate the people of Iceland. 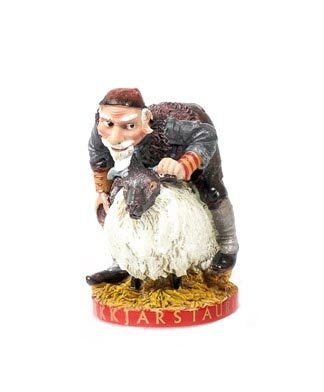 Icelandic name: Stekkjarstaur. 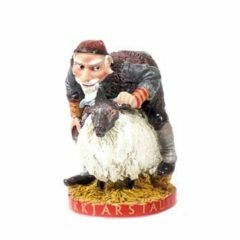 He’s a stiff-legged yule lad who arrives with the intent to hassle sheep. Sheep-Cote Clod arrives on December 12th and leaves on the 25th. 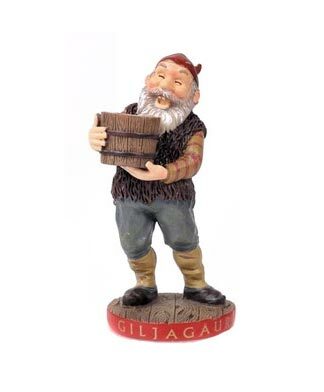 Icelandic name: Giljagaur. 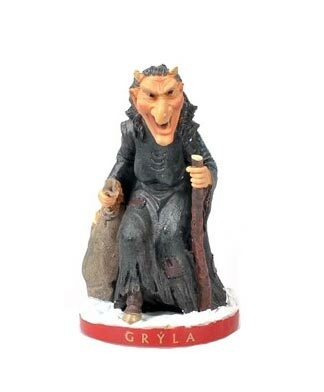 This yule lad hides in gullies and waits for a chance to sneak into barns to steal milk. The Gully Gawk arrives on December 13th and leaves on the 26th. 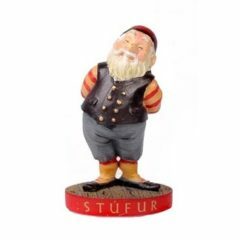 Icelandic name: Stúfur. He’s a very short guy who enjoys eating crusts of bread from pans. 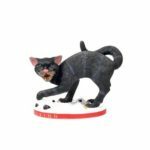 Stubby arrives on December 14th and leaves on the 27th. 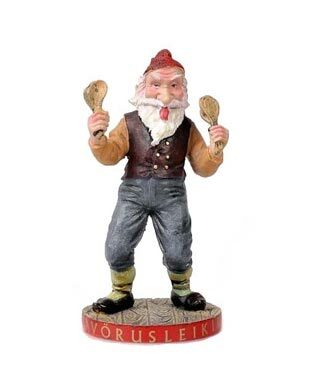 Icelandic name: Þvörusleikir. A malnourished yule lad who steals spoons and, true to his name, licks them. The Spoon Licker arrives on December 15th and leaves on the 28th. Icelandic name: Pottaskefill. This yule lad eats leftovers from pots and pans. 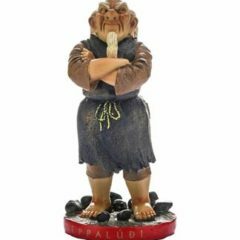 The Pot Scraper arrives on December 16th and leaves on the 29th. Icelandic name: Askasleikir. He hides under beds and steals bowls. The Bowl Licker arrives on December 17th and leaves on the 30th. 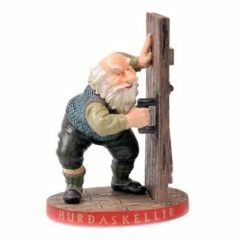 Icelandic name: Hurðaskellir. 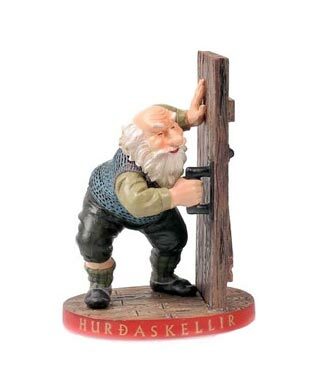 Our favorite of the yule lads- he enjoys slamming doors to startle residents. The Door Slammer arrives on December 18th and leaves on the 31st. 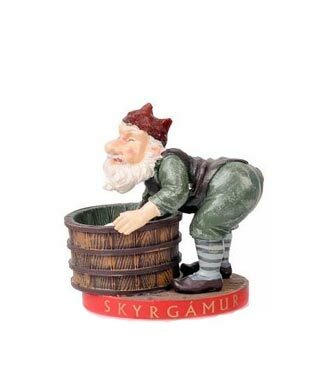 Icelandic name: Skyrgámur. 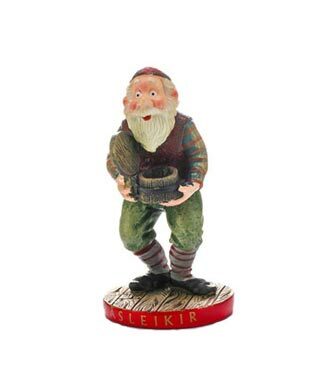 This yule lad has an affinity for Icelandic Skyr (a delicious yogurt-like product). The Skyr Gobbler arrives on December 19th and leaves on January 1st. Icelandic name: Bjúgnakrækir. Smoking sausages? 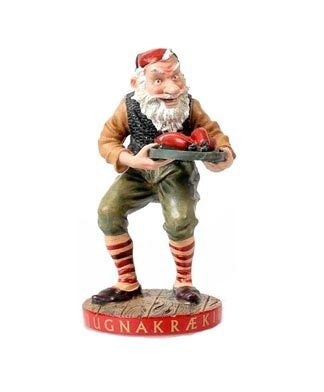 Watch out for this yule lad- he is known for snatching sausages as they smoke. The Sausage Swiper arrives on December 20th and leaves on January 2nd. 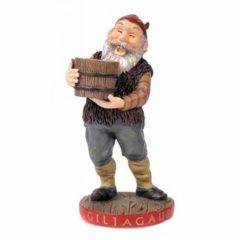 Icelandic name: Gluggagægir. 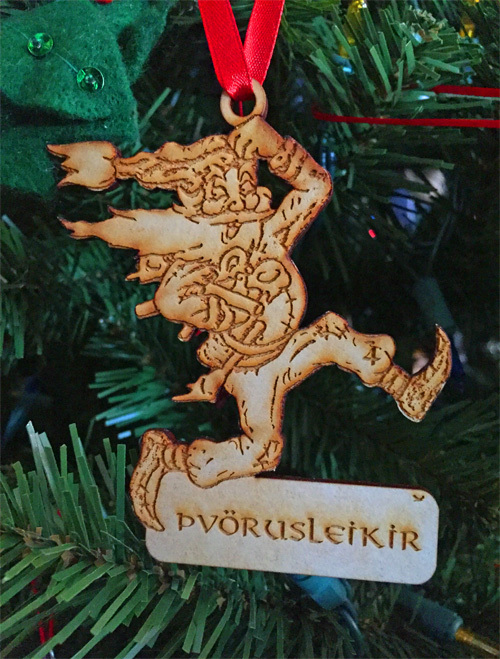 Watch out for this yule lad. He is known for looking through windows to find items to steal. 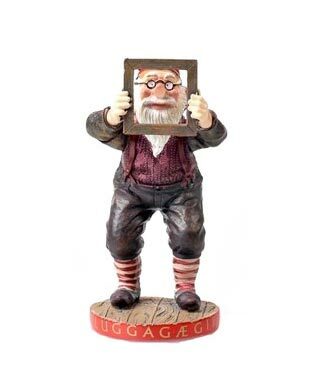 The Window Peeper arrives on December 21st and leaves on January 3rd. 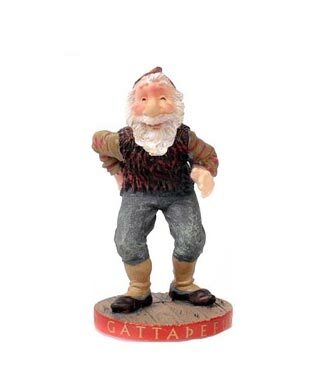 Icelandic name: Gáttaþefur. 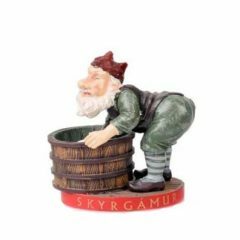 He uses his abnormally good sense of smell to find Icelandic Laufabrauð, a bread traditionally eaten at Christmas. The Doorway Sniffer arrives on December 22nd and leaves on January 4th. 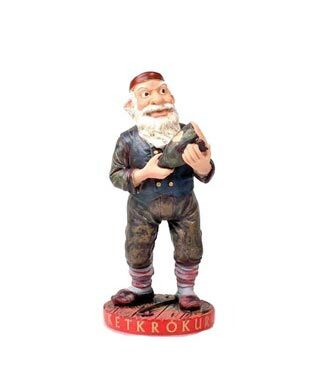 Icelandic name: Ketkrókur. 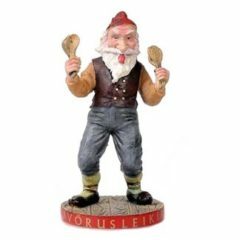 This yule lad- surprise!- uses a hook to steal meat. Meat Hook arrives on December 23rd and leaves on January 5th. 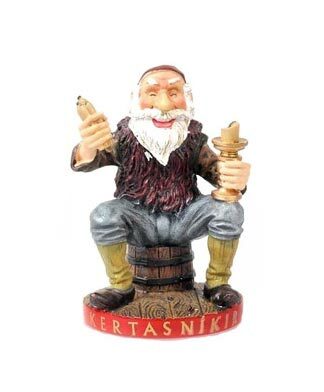 Icelandic name: Kertasníkir. This guy is famous for following people around and stealing their candles. The Candle Stealer arrives on December 24th and leaves on January 6th. Just in case you thought this tradition couldn’t possibly get any better, I assure you it can: the family also has a pet “yule cat” named Jólakötturinn that eats children who don’t receive new clothes for Christmas. Looking through the list, it’s hard to overlook the fact that most of the lads seem intent on committing some form of crime: I counted theft, home invasion, harassment, and one might be a peeping tom. Murder in the first degree also seems to be a possible charge for their mother and their cat. 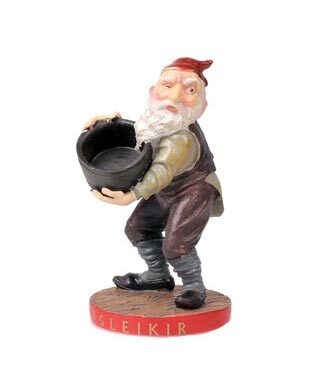 However, the Yule Lads aren’t just wandering the city looking to anger the good people of Iceland. Beginning on December 12, children leave their best shoes on the window sill, and each night as the Yule Lads come to town they leave a small treat in the shoes of good children and a rotten potato for the bad kids. Then, beginning on December 25th, the Yule Lads return home one by one in the same order they arrived, with the Sheep-Cote Clod departing first and the Candle Stealer heading back to the mountain on January 6. 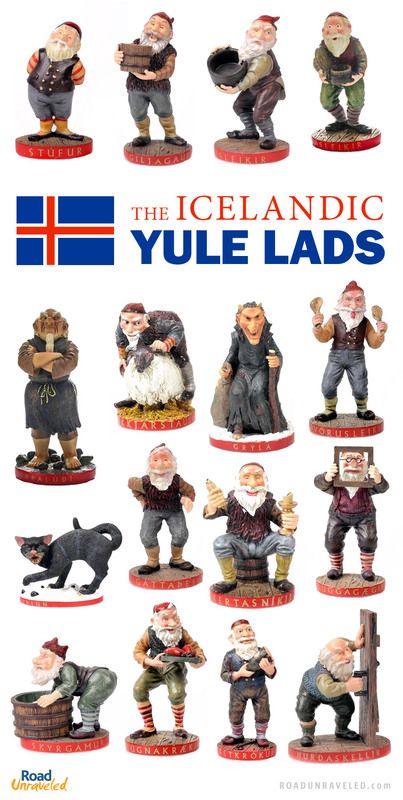 Iceland loves the Yule Lads. We saw their likeness everywhere. 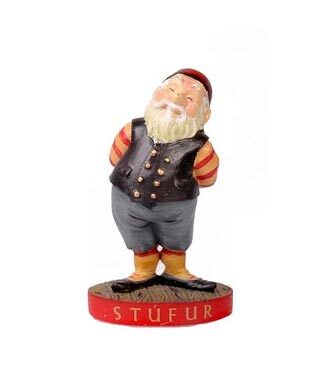 They had Yule Lad Christmas ornaments and books in every store. 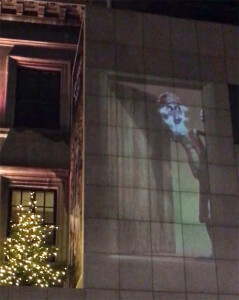 We saw them in window displays and in holograms projected onto the sides of buildings. 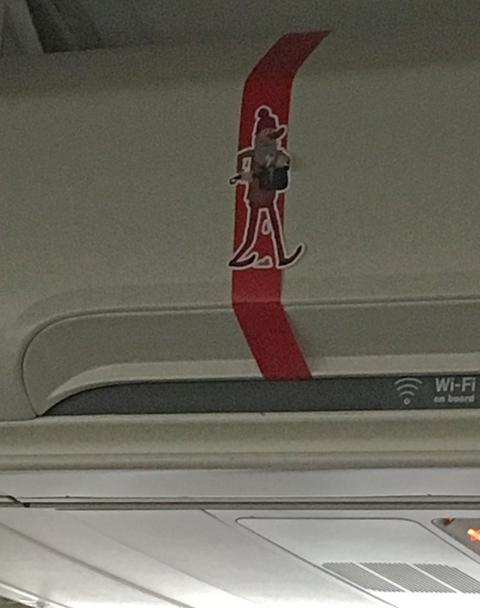 We even saw them on Icelandair as we flew home; as the flight attendants closed the overhead bins there they were, decorating the plane. We loved how festive the Yule Lads made the city feel, and we loved learning about the tradition and the story. 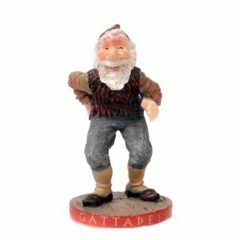 In fact, we brought home the Candle Stealer as an ornament for our Christmas tree and a decorative Door Slammer to display in our home next year. There is a lot to take in when it comes to the story of the Yule Lads. This slideshow should help put a face to the name for each of the Yule Lads and their extended family. We weren’t expecting to learn so much about Iceland’s holiday traditions, but not only did we learn about them, we found elements we can’t wait to embrace as part of our own celebration next year. After spending an incredible evening watching fireworks on New Year’s Eve in Cape Town last year, we were looking forward to trading in heat and sunshine for cold and darkness (Iceland only sees about four hours of daylight in late December!). Our last night of 2015 started with a visit to one of the biggest bonfires we have ever seen. 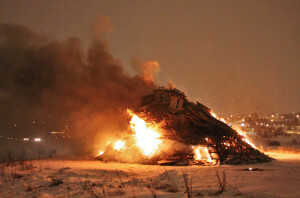 Brenna bonfires are a huge part of New Year’s Eve in Iceland. They stem from a pagan tradition in which people would take their old belongings and toss them into a fire; they would literally burn up the old year and clear the way for the new one. Today people don’t burn their possessions, but the tradition of friends and family gathering at their favorite bonfire to celebrate with neighbors and even strangers lives on in the country. Some Icelanders also claim elves attend the bonfires. At many bonfires in Iceland locals sing songs about elves since they are traditionally believed to be out and about on New Year’s Eve. We loved hearing Auld Lang Syne sung in Icelandic while we watched the New Year’s Eve bonfires. 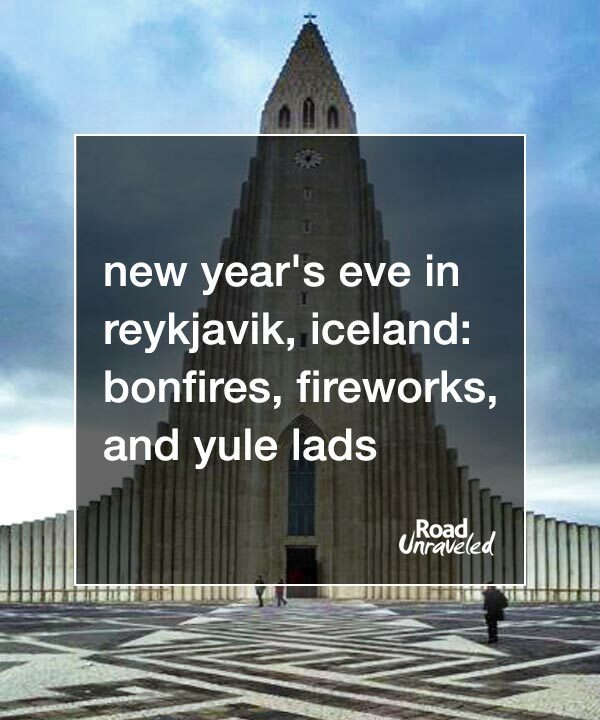 There are several bonfires throughout the greater Reykjavik area, both large and small, and the locals have their favorite- every time we said goodbye to someone we met they would let us know which bonfire we should go to for New Year’s Eve. The bonfires start around 8:30 PM and last for about two hours, when they end abruptly while the entire population of Iceland disappears inside… to watch TV. Watching Áramótaskaupið is another Icelandic tradition. Áramótaskaupið is an annual satirical show that reviews the year. To say it’s popular would be an understatement; more than 90% of Iceland’s population watch the show live. As foreigners who don’t speak the local language, we didn’t watch it live (we instead found ourselves in a hotel eating free cookies and drinking hot cocoa, which wasn’t a bad alternative). We found the 2015 show on YouTube, but it doesn’t seem to have an English translation. It was fascinating to watch as the streets completely emptied while all of Iceland turned their eyes toward their TVs. There weren’t even cars on the street for that hour. But we knew exactly when the show was over- it was when the skies exploded with color. Fireworks begin early in the evening, ceasing completely by 10:30, but by 11:30 the sky is full of them. 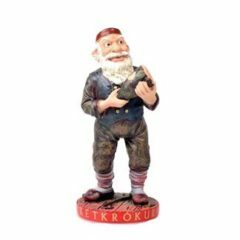 There is no single fireworks display in Reykjavik. Instead, families purchase them from the Icelandic Association for Search and Rescue as part of a fundraiser and shoot them off in their own backyards. What this meant for us is we were treated to a panoramic view of the city peppered with bursts of color. For 30 minutes the intensity built until midnight finally arrived, when the city exploded with noise and light. Just before midnight the wind and snow picked up and we saw fireworks in a blizzard for the first time in our lives. It was freezing cold, incredibly windy, the snowflakes cut like razor blades on our cheeks, and yet we couldn’t stop smiling. It’s not every year you get to experience that kind of display! 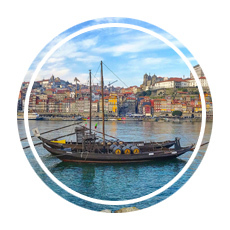 The City Center Hotel is walking distance to restaurants, bars, the tour office, and shopping. If you’re looking for a convenient spot in the city, this is the way to go. Welcoming staff, well priced, and the location could not be any better. We stayed here on our first trip to Iceland. It’s location on the marina gives you a beautiful view of the harbor, it’s walking distance to Harpa, and it’s just a little farther to the downtown area. The hotel has nice rooms and a wonderful staff. 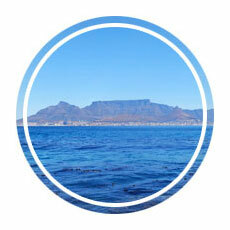 Looking for more hotel options? 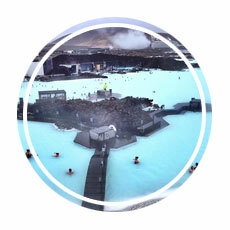 Here are some additional deals to consider as you plan your own New Year’s Eve trip to Reykjavik. 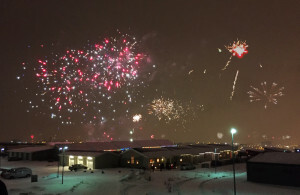 VISIT REYKJAVIK FOR NEW YEAR’S EVE! The party doesn’t stop in Reykjavik until long after midnight. Fireworks went off throughout the night, and the bars were packed until 6:00 AM. 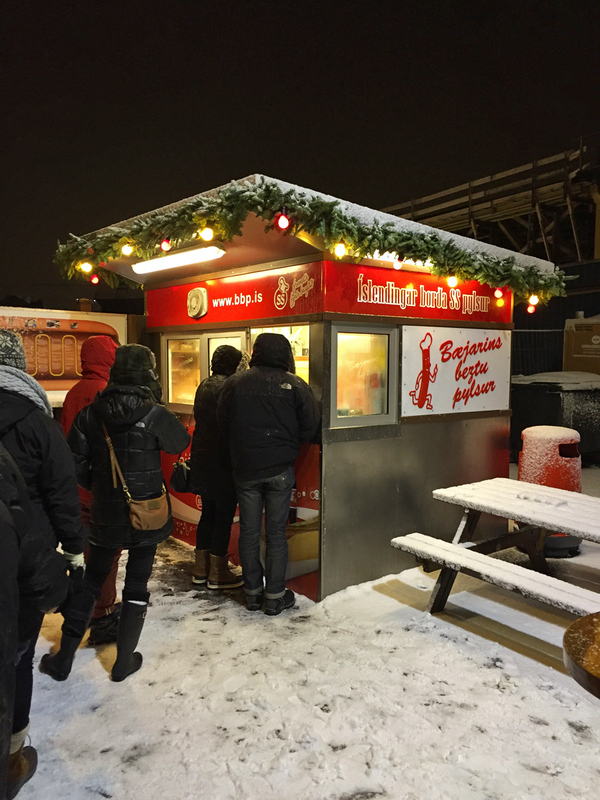 Our evening ended in the line at Bæjarins Beztu Pylsur for hot dogs with lots of other hungry travellers. By the time we got up the next morning some people still had not ended their fireworks celebration. And who could blame them? The holidays in Iceland are truly magical; if you have the chance to experience their local traditions, don’t pass it up! 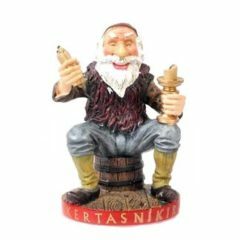 Visiting Iceland for New Year’s Eve? Here are a few more posts about New Year’s Eve vacation destinations!